As I have become older I have become a snorer. I don't think it has to do with my age so much, it's more than likely because of being overweight. Whatever the reason I know that sleeping and not getting a good amount of air can lead to some cranky days. 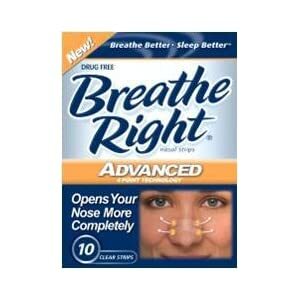 Did you know that Breathe Right Advanced can help you breathe better even when you have a cold! I was given the opportunity to try the Breathe Right Advanced strips and they are like small miracles in a box. They difference between waking up without one on and with one on are so different I don't think I have the right words to explain it, but I'll do my best! After using the Breathe Right Advanced I woke up feeling like I had actually slept! I did not wake up with a headache and I did not feel as groggy. The benefits of Breathe Right Advanced are not just for congested noses from a cold, you can use them if you suffer from allergies, have a deviated septum and if you just snore from a stuffed up nose. The strip can offer immediate relief by opening the nasal passages and being able to breathe easier. The Breathe Right strip actually lifts your nasal passages and that is how you are able to breathe through your nose that much better. I love being able to breathe through my nose now when I sleep, I feel so much more rested. If you are interested in more information about all Breathe Right products or if you would like to try a sample nasal strip you can visit the Breathe Right website. *Disclosure: Please note that I received this product in order to conduct a review. I am a part of smiley360.com and they provided me with the means to try the product, but they had NO influence over my opinions. All opinions in this post are 100% my own. No other monetary compensation was provided.